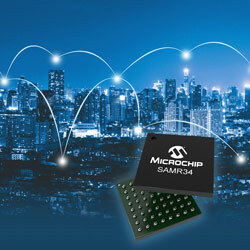 Microchip has released a highly integrated LoRa SiP family with an ultra-low-power 32-bit MCU, sub-GHz RF LoRa transceiver and software stack. The combination of long-range wireless connectivity with low-power performance is designed to accelerate the development of LoRa-based connected solutions. The SAM R34/35 SiPs are supported by certified reference designs and proven interoperability with major LoRaWAN gateway and network providers, simplifying the whole development process with software, hardware and support. The devices also offer what is claimed to be the industry’s lowest power consumption in sleep modes, providing extended battery life in remote IoT nodes. Most LoRa end devices stay in sleep mode for long periods of time, only waking occasionally to transmit small data packets. Powered by the ultra-low-power SAM L21 Arm Cortex-M0+ based MCU, the SAM R34 devices offers sleep modes as low as 790nA to reduce power consumption and extend battery life in end applications. Highly integrated into a compact 6mm x 6mm package, the SAM R34/35 family is perfect for a wide array of long-range, low-power IoT applications that needs small form factor designs and multiple years of battery life. The company’s LoRa family is offered in six device variants, giving developers the flexibility to choose the best combination of memory and peripherals for their end application. The SAM R34 devices provide a 64-lead TFBGA package, and the SAM R35 devices are offered without a USB interface.